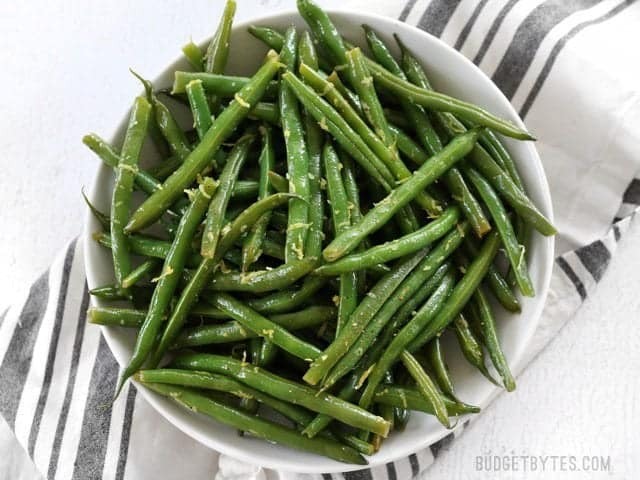 The combination of fresh lemon and butter gives these green beans a rich yet bright flavor that highlights their natural goodness. The tangy lemon balances the creamy butter quite perfectly, while salt and pepper add just a little punch. And that’s all you need! Really! The trick to making these green beans out-of-this-world good is to not over cook them. The beans should still have quite a bit of “tooth” to the texture, without having that raw flavor. The color should be a bright vibrant green rather than a dull olive color. This is how you do vegetables right. P.S. The “lemon butter treatment” works well with other vegetables, too. I do the same thing with broccoli fairly often. 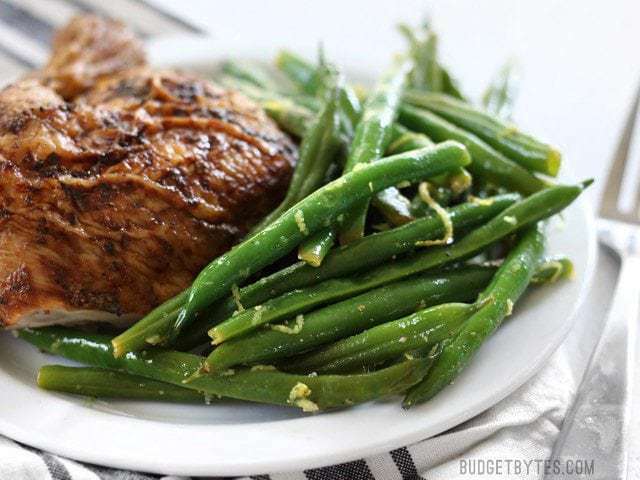 Lemon Butter Green Beans are the perfect go-to all-purpose side dish with a fresh and vibrant flavor. Only five ingredients needed. Use a microplane, zester, or small-holed cheese grater to remove the thin layer of yellow zest from the lemon. Set the zest aside. Remove the stems from the green beans and, if you prefer shorter pieces, snap them in half. 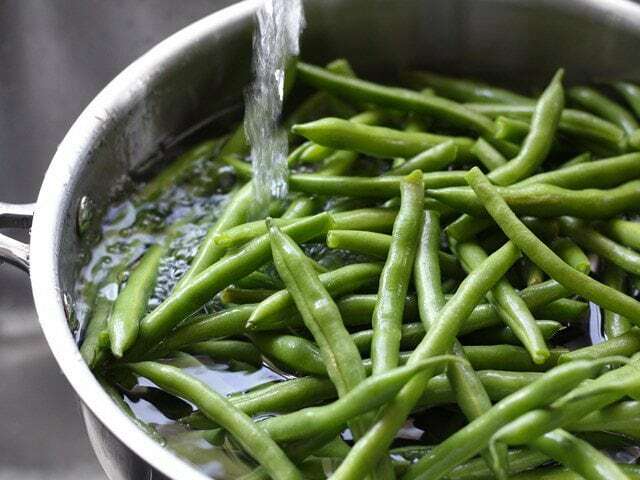 Place the green beans in a colander and rinse well with cool water. 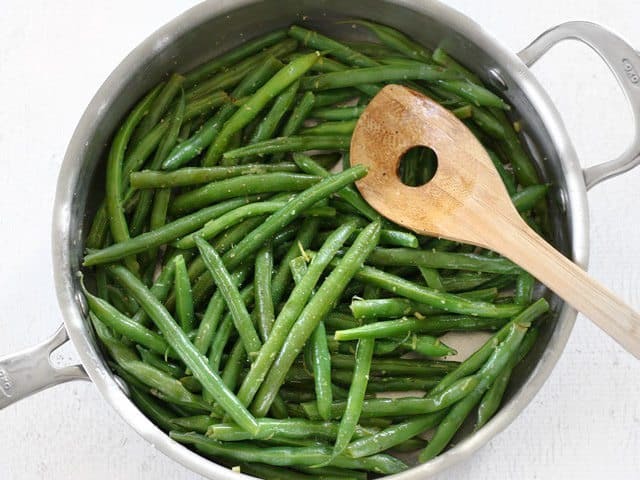 Transfer the rinsed green beans to a deep skillet. Add about one inch of fresh water (the water will not cover the beans). Place a lid on the skillet and turn the flame on to medium-high. Allow the water to come up to a boil. Let the beans simmer and steam for 3-5 minutes, or just until the beans are bright green and just slightly tender. Test the texture with a fork. 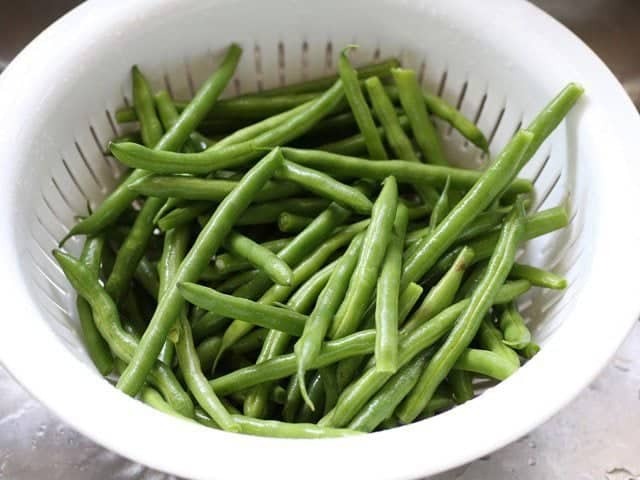 Once the green beans are bright green and slightly tender, turn off the heat and drain them in a colander. 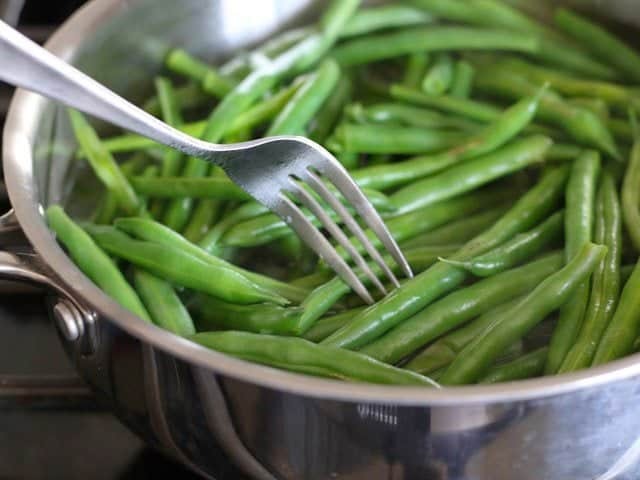 Return the drained green beans to the still-warm skillet with the heat turned off. Add the butter, about 1/2 tsp of lemon zest, a quick squeeze of the lemon juice (about 1 tsp), a pinch of salt, and some freshly cracked pepper. Toss the green beans to distribute the seasonings and allow the residual heat to melt the butter. 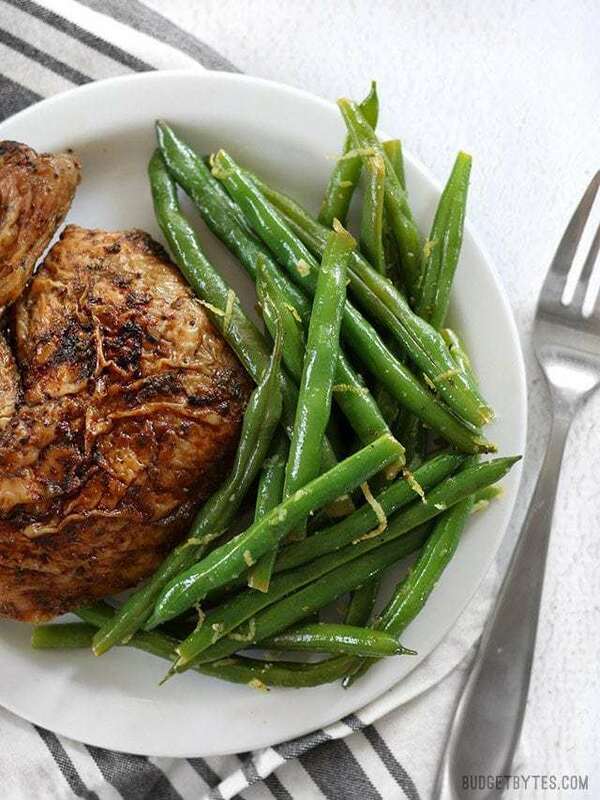 When the butter has melted fully, taste the green beans and add more salt, pepper, lemon juice, or lemon zest to your liking. Serve immediately. 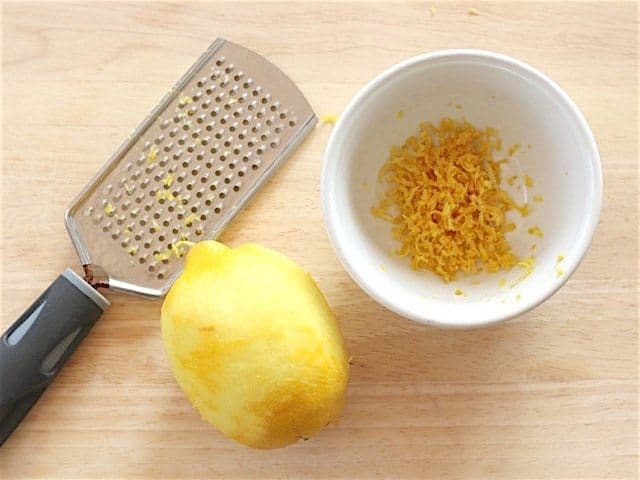 Use a microplane, zester, or small-holed cheese grater to remove the thin layer of yellow zest from the lemon. Set the zest aside. Snap the stem ends off of one pound of fresh green beans. If you like smaller pieces, you can also snap each bean in half. Place the beans in a colander and rinse with cool water. 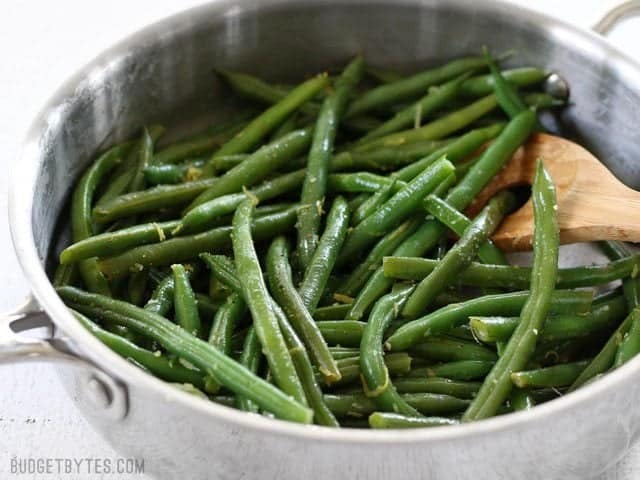 Add the washed green beans to a deep skillet and add about one inch of water. The water should not cover the beans. The water is just there to generate steam. You can use a steaming basket, but I find it unnecessary. The cooking time is so brief that the beans at the bottom that are IN the water don’t seem to cook any more than the beans on top that only get steam. Place a lid on the skillet and then place it over a medium-high flame. 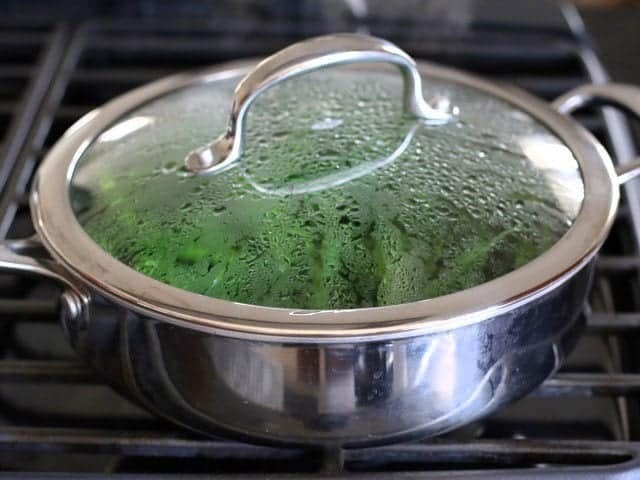 Let the water come to a boil, then let the beans continue to simmer/steam in the skillet for 3-5 minutes, or until they are bright green and just barely tender. Test the texture with a fork. They should be slightly softer than the fresh beans, but still have quite a bit of “tooth” or crunch. You don’t want to over cook them here because they will continue to cook a bit from the residual heat. The color should be bright green. If they’re a dull olive color, they’ve cooked too long. Drain the cooked beans in a colander and then return them to the skillet with the heat turned off. The beans and skillet should still be quite warm, though. Add 1 Tbsp butter, about 1/2 tsp zest, a squeeze of the lemon juice (about one teaspoon), and some salt and freshly cracked pepper. Toss the beans to distribute the seasonings and to allow the residual heat to melt the butter. 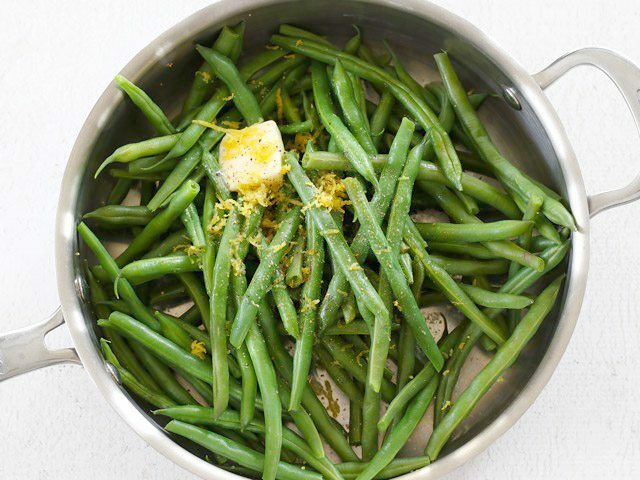 Taste the Lemon Butter Green Beans and add more lemon juice, zest, salt, or pepper to your liking. Serve immediately and enjoy their fresh, vibrant, and snappy flavor and texture. ❤️❤️❤️ My fav! Tried this recipe today and NOT disappointed !!! These were perfect ❤️Thank you!! How convenient! I was just wondering what to do with my green beans this evening and was just going to give them my usual balsamic treatment, but I’m going to go with this instead. It seems so wonderfully fresh! Which I need with the teasing weather. Come on already, spring! 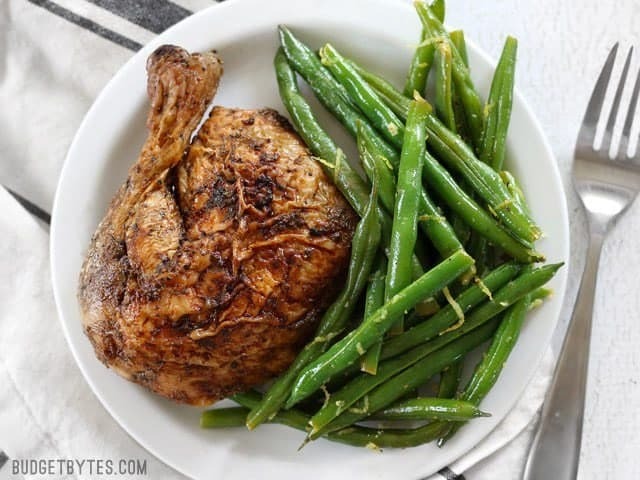 I’m in love with the southern green beans style (simmered with bacon and smoked meats, YUMMMM), but totally making this tonight with fresh green beans cause it’s a heck of a lot quicker and healthier/fresher! Hi! These look exactly like what I was hoping to do for a grad party this weekend. If I make them that morning do you think they will hold up in a chafing dish over a few hours to keep them warm? Thank you!! Hmm, I think if they sit in a chaffing dish they risk over cooking and turning that darker olive green color. I’m not sure how the fresh lemon flavor will hold up. It might not be as punchy after sitting in the heat for so long. Good to know, I’ll keep looking – thanks! hi Beth, if i cooked this ahead how many days can i store in the fridge? And can I freeze them? thank you. Hi, if I buy beans in bulk I rinse, dry and freeze them until later. Then only defrost a little, cut the bottom parts of and cook as usual. No damage done! I love fresh green beans! Well any green beans but fresh just have that extra something special. So excited to start seeing them around more! Lemon and butter (or olive oil or both) make nearly everything good. Beth, these photos are outstanding. Way to go!